These bylaws are the Molesworth Recreation Reserve Bylaws 2017. These bylaws come into force on the 28th day after the date of their notification publication in the New Zealand Gazette. 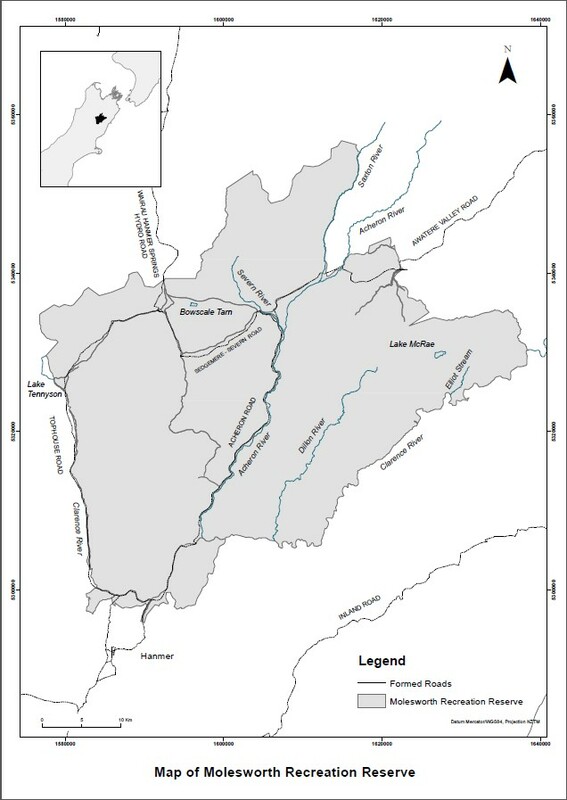 West Zone means the area identified on the map in Schedule 3 as the West Zone. (k) Big Eddy at any time. (c) for reasons of public safety. unless that person holds an activity permit for such access. (b) he or she remains on a formed track. (1) A person must not enter, or remain in, a station operational area. (2) Subclause (1) does not apply to any volunteer who requires access for management purposes. (3) In this bylaw, volunteer means any person authorised as such by the Minister to carry out certain functions and duties in the reserve for management purposes, on behalf of the Department of Conservation. (1) A person may camp in the reserve, subject to subclauses (2) and (3). (b) without paying the camping fees specified in Schedule 5, where applicable. (b) a period specified by the Minister. (1) A person must not hunt in the reserve during the hours of darkness or using a spotlight or using night vision equipment. (2) Subclause (1) does not apply to any person hunting at night as part of an organised event that has written permission of the Minister; or to any person hunting at night as part of the Lessee’s pest control. (3) A person hunting in the reserve, or in possession of a firearm, weapon, trap, net, or other like object in the reserve, must hold a hunting permit. (4) Subclause (3) does not apply to the Lessee or any employee authorised in writing by the Lessee to carry out pest control. (e) use an aircraft in the reserve to set down, pick up, or recover in the reserve any person, livestock, carcass, or article of any description. (c) if the person holds a concession for the activity. (3) A person must not use a helicopter in the reserve for recreational purposes. (4) A person must not use an unmanned aircraft in the reserve without an activity permit. (5) In this bylaw, aircraft includes aeroplanes, helicopters, gliders, unmanned aircraft and balloons. (1) A person must not light a fire in the reserve. (3) A person must not light a fire if it likely to present a fire hazard, even if the fire is one that subclause (2) applies to. (b) arrange for a responsible person to attend the fire until it is completely extinguished. (b) replaced by another person who attends the fire under subclause (4)(b). (b) any lighted cigarette or other lighted material. (b) allow any animal in the person’s custody or charge or under the person’s control to be in the reserve. (c) bringing a disability assist dog into the reserve, in accordance with section 75 of the Dog Control Act 1996. (3) A ranger may seize and detain any animal that is in the reserve in contravention of subclause (1). (b) be committed to the local pound of the local authority, if the ranger does not know and cannot reasonably ascertain who the owner is. (5) In this bylaw, animal includes all domestic animals. (6) In this bylaw, local authority has the meaning given to it by section 2(1) of the Reserves Act 1977. (c) if authorised by an activity permit. (2) A person must not take, ride, or drive a vehicle into or in the reserve in a dangerous manner. (4) Subclause (3) does not apply to any person who has written permission from the Minister. (5) In this bylaw, vehicle does not include a bicycle. (1) A person must not park a vehicle or leave a bicycle in the reserve so that the vehicle or bicycle obstructs an entrance, gateway, path, road, or track in the reserve. (2) The driver of any vehicle must ensure that it is parked in a safe and considerate manner and position. (3) In this bylaw, park means to stand the vehicle for a period exceeding 5 minutes. (c) be intoxicated, noisy, or riotous. (2) A person who contravenes subclause (1) must leave the reserve if requested to do so by a ranger. (a) A person must not carry or use a dangerous weapon in the reserve without the prior written permission of the Minister. (b) In this bylaw, dangerous weapon includes a firearm, a bow and arrow, a catapult, or a shanghai. (c) pollute or render unfit for purpose (whether for human consumption or not) any water supply in the reserve. (1) A person in the reserve must take his or her litter out of the reserve. (b) any substance or article of a dangerous or offensive nature. (b) enter in or remain on any part of the reserve marked out as a playing area for a sport or game while the sport or game is in progress. (b) interfere with a placard, bill, poster, or notice lawfully erected in the reserve. (2) A person who is distributing a notice or handbill in the reserve must stop doing so if directed to stop by a ranger. (1) A person must not do an act prohibited by subclause (3) to anything in the reserve that does not belong to the person. (2) However, subclause (1) does not apply to an act done with the prior permission of the Minister. (e) painting or carving or writing names or letters or words or figures or devices. (1) These bylaws do not apply to any employee or contractor of the Lessee who is in the reserve in his or her capacity as an employee or contractor, while he or she is carrying out his or her functions and duties as an employee or contractor. (2) These bylaws do not apply to any employee or contractor of the Department of Conservation who is in the reserve in his or her capacity as an employee or contractor, while he or she is carrying out his or her functions and duties as an employee or contractor. (1) These bylaws do not limit or affect the requirements in or under any other enactment. (2) Without limiting subclause (1), bylaws 9 and 10 do not limit or affect the application of any Act or regulations relating to the operation of aircraft or the lighting of fires. Every person who does not comply with any requirement in or under these bylaws commits an offence and is liable to the penalty specified in section 104 of the Reserves Act 1977. Dated at Wellington this 20th day of December 2017. 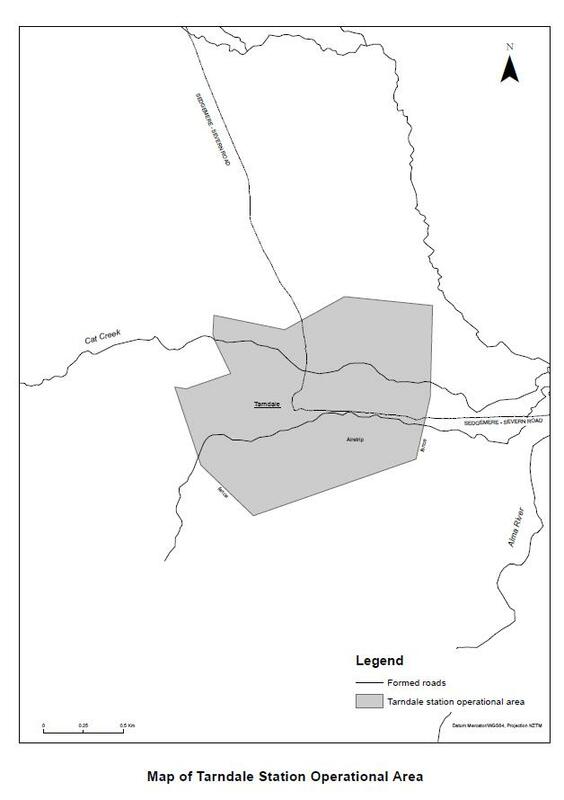 (Area ha 44,070.113) Parts Section 6, Square 70, situated in Rainbow, Wairau and Alma Survey Districts; Section 1, SO 15300 and Section 1, SO 15320. (Area ha 84,280.820) Parts Run 226 and Run 227, situated in Molesworth, Barefell, Tone and Acheron Survey Districts; Section 1, SO 7206 and Section 1, SO 7202 and Crown river bed, being parts of the Awatere, Acheron and Clarence River Beds. (Area ha 52,436.706) Parts Run 345, situated in the Severn, Alma and Percival Survey Districts; Section 1, SO 19494 and Crown river bed, being parts of the Acheron and Clarence River Beds. Including all the marginal strips created by the granting of the lease from the Crown to Landcorp Farming Limited under the Land Act 1948, dated 11 May 2005. Description of sites within Molesworth Recreation Reserve, which are also indicated on the map in Schedule 3. (1) All fees are GST-inclusive. Note that there is no charge to camp outside a Departmental hut.